This is why we take from Egypt the primary Kelim (vessels), which are valuable in the eyes of the great evil inclination, and through which we emerge from the period known as “Egypt” and enter the recognition of the evil inclination, building from them the golden calf. When everything appears clearly and intensely, we truly need the Torah. This is the reason why the first tablets where inappropriate for correction, but only the second tablets, with which Moses descended on the Day of Atonement and brought them to the people of Israel, once the people recognized the evil in them. We know the evil in us and need the Torah only after we see the golden calf within us and how we resist love of others and want to exploit the entire world. The Torah explains the stages of building of the tabernacle—which desires out of the sum of evil desires we have toward others do we correct from receiving into giving, from hate to love. This is the whole Torah, the instruction how to do this. Instead of being immersed in our evil inclination, seeing only the narrow reality of this world, if we correct our desires even slightly we can open ourselves to see the upper world, here and now. As we develop in this manner, the world around us opens and appears as the world of Assiya, Yetzira, Beria, Atzilut, and Adam Kadmon—the world of Ein Sof (infinity)—at the end of correction. First, we build a small Neshama (soul) that is common for all. This is the “tent of meeting, which includes the still, vegetative, animate, and speaking, which is our quality, the Yod–Hey–Vav–Hey, the complete HaVaYaH within us. We must take from each desire and connect everything into a single, integral desire that is common to all, and which will connect to all the people who are ready for it, building together a united, common Kli (vessel). This is how everyone advances. A person must have the qualities of Bezalel, of a priest, Aaron the priest, and certainly those of Moses—the first of the priests, Levites, and Israel. The Torah explains how we can use the light that we draw in order to understand which desire we can correct now, and which we can correct later. As Moses said in the previous portion, only half of the desires were corrected using the half shekel, the shekel of the holiness. The other half comes from above. The half is our deficiency, and the other half is the light that corrects and complements. With our efforts we build everything that depends on us, all the qualities of the soul: priests, Levites, and Israel, using silver, gold, and various precious stones. Through the mind and heart that only the qualities of Bezalel have, as it is a replication from the Creator, we feel that we have an example by which to build our soul in accord with the Creator who appears before us. This is how we build the soul in which we experience the new world, which is the Kli, our corrected desire. Within that desire is the force of bestowal and love called Boreh (the Creator), Bo Re’eh (come see). This is how we come to see, discover the Creator. The first steps alternate in appearance between cloud and fire, as the Creator ascending and descending. “Rise up, O Lord, let Your enemies be scattered, and let those who hate You flee before You” (Numbers, 10:35). In our current situation, in our world, we cannot talk about these things or about the parts we need to correct because we still have no sensation of our soul; we do not find these desires in us or know quite how to scrutinize them or connect them in this extremely complex system. The Torah tells us this as a story that is a replication from this world: rocks, trees, people, clothes, the world in general, time, motion, and place. These forms are described so we may discern which parts of the soul we must correct. Kabbalists tell us about the forces that operate, about the parts of the soul. The Book of Zohar with the Sulam (Ladder) commentary that Baal HaSulam wrote narrates it in the language of Kabbalah, so we can understand what is meant by the words of the Torah. We can understand that the Torah speaks only of the parts of our soul, the correction of the heart, which is our desires. In this manner we can unravel the entire Torah, discover it in our hearts as a corrected system, and discover the upper force, the Creator, within all that. What does it mean to gather? Gathering refers to the children of Israel that Moses assembles in order to declare the Sabbath day, which is the conclusion of the work. The goal must be clear from the start because “the end of an act is in the preliminary thought.” If we know why we must achieve Dvekut (adhesion) with the Creator, why we must make ourselves similar, discover Him, and be like Him, literally “face to face,” namely be in Moses’ degree, we must know it in advance. Even in the smallest action, there must be the same goal, the same clear line drawn out and compelling us to advance only in this direction. Whatever problems arise along the way, ascents, descents, and twists, they will all be for progressing. This is why in the desert that Israel traverse there is constant recognition of the evil, and it is actually for the best. Additional desires keep surfacing and we must correct them in order to advance toward the land of Israel—the corrected desire where the Creator resides. Why do we have to know all the details by which we advance, these ascents and descents? This is how we attain the plan of creation, its purpose, the understanding, sensation, and knowledge of it. There is a difference between the will to receive that the Creator created existence from absence in the beginning of creation, and the will to receive at the end of creation. At the end of creation that desire has a mind. It remains the same will to receive, but with a mind, comprehension, recognition, and sensation. Everything comes from the connection of mind and heart. Will a person necessarily experience all the elements described in this portion? A person will not experience it without planning to, without desiring to participate, without raising MAN and requesting to correct. Only one who wants, feels, and is aware of how much he or she hates but wants to love will experience everything. Therefore, we must correct some of the still in us, some of the vegetative, and thus discover the reality we are in, and from it reveal the other reality. Gradually, we become a structure that contains all the mind and heart, all the wisdom in the world. The whole of nature is within us and we include all the worlds. There is nothing outside of us. The vast world we depict outside of us does not exist; it is only depicted in this manner in our external Kelim, which must all be made internal. Hence, there is nothing but man and the Creator who are as a single system. “Take from among you a donation.” When a person places his will for the work of his Master, that will first rises to the heart—the persistence and the basis of the entire body. Afterwards that good will rises over all the organs of the body, the will of all the organs of the body and the will of the heart join together, pulling over them the brightness of Divinity to dwell with them. And that person is the Creator’s portion, as it is written, “Take from among you a donation.” “From among you” is the extension, to take upon yourselves that donation, the Divinity, so that the person will be a portion of the Creator. Initially, there is an egoistic desire that a person corrects by donation. The donation is the part of the will to receive with which one can enhance the quality of bestowal. The donation raises the part of bestowal with which one wants to dominate and advance. By donations that we put aside from the ego, namely parts we can sanctify and invert how we use them into bestowal and love, we advance up to the end of correction. At that time it is not building a tabernacle or advancing in the tabernacle in time, place, and motion. Rather, it is reaching Mount Moriah and building the Temple. Kabbalists attain the complete structure, the complete soul, called Beit HaMikdash (House of Holiness, Temple). In it are all the parts: priest, Levite, Israel, and the nations of the world. The great Kabbalist, Ramchal, Rabbi Moshe Chaim Lozzato, wrote a special essay known as “The Dwelling Place of the Most High,” in which he drew in great detail what the third Temple should look like. He did not refer to the rocks in Jerusalem, but to the structure of the corrected soul, which must eventually be on the Sabbath, as was said at the beginning of the portion. We arrive at the Sabbath upon the conclusion of the six days, or six thousand years, when all the Kelim are corrected and there is nothing more to do or to work with but to enjoy in happiness and peace. When the children of Israel bring donations, Moses says, “That’s enough, you’ve gone too far.” It sounds odd because we say that there are no limits on bestowal. True, but each degree has its own scrutiny. The soul consists of three parts: NHY, HGT, HBD, or Ibur (conception), Yenika (nursing), and Mochin (mindfulness/adulthood), or Nefesh, Ruach, Neshama. Neshama is named after the great light that can be in it. Hence, on the degree of Israel they give a lot; on the degree of Levites they give less; and on the degree of priests they give even less. It depends on a person’s degree and on who is performing the scrutiny. It also depends on the degree to which a person raises the desires. If the person stays in desires of the Israel degree, whatever one brings is fine. But when the desires are at the level of Levites or priests, we haven’t enough forces to be in such a high degree with all of our desires, so they are restricted. This is the meaning of the degrees in the soul. If the Creator gives to us and then says, “Give it back,” why did He give it in the first place? The Creator created an entire world, the world of Ein Sof, then broke it and gave us a broken world and a broken Adam (soul) so we may fix it. It is similar to a puzzle or LEGO bricks that we put together and learn as we advance. If we give this game to a child without putting it together, the child will break it because children are driven by the urge to understand and know. By nature, we cannot approach a complete thing. To understand it, study it, we must have it broken. How does all that connect to donations? We are in the middle. We do not belong to the evil inclination; it is not our own because in truth, the Creator has made it and given it. We also do not belong to the light that reforms. Our job is only to connect the two: the corrupt desire below with the light from above. That is, all we need is to ask, demand, and pray for correction. How do we do it properly? How should we prepare this work so that we bring it to the Creator in the right way? Our work is to sort each desire whose time has come. First we scrutinize it through the light, then set it up for correction through the light and ask for correction. These things can happen only by the light that shines, so without studying the wisdom of Kabbalah it is impossible to do anything, as this is what brings the light. Do we receive the light when we study Kabbalah? Yes. During the study a person begins to feel how everything falls into place. If the study is done properly, it takes some time for one to actually achieve it, but then one can study the Bible, the Pentateuch, Gemarah, and Mishnah and they will all be a source of light to that person. It is a calculation that faults all the calculations in the world—extension of GAR de Hochma—which are not of Kedusha [holiness], for they do not persist, but destroy the place to which they are drawn. Yet, this calculation in the tabernacle, which is VAK de Hochma, persists more than all the others, and by that the tabernacle persists, and not by another. There is a big difference between VAK and GAR. GAR means we are drawing by ourselves; VAK means that we are rejecting, that everything is done in bestowal. The lights are all passing through us; we are receiving the full Ein Sof in order to convey it to everyone. But we are not harmed when we work entirely in order to bestow, thus making ourselves similar to the source, the Creator. He passes through Him to everyone, and likewise, when we all connect, passing from everyone to everyone, the great sphere called “the common soul of Ein Sof” is made. Midrash Rabah, Shemot (Exodus), Portion 2, Paragraph 4. Babylonian Talmud, Masechet Kidushin, p 70a. 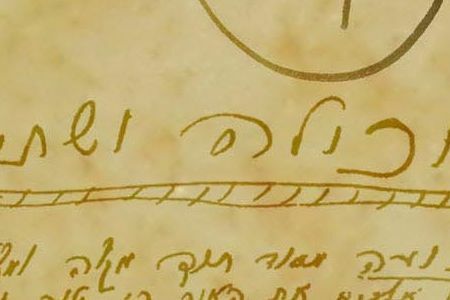 The Writings of Baal HaSulam, p 766. Babylonian Talmud, Masechet Kidushin, 30b; Midrash Rabah, Eicha, “Introduction,” Paragraph 2. 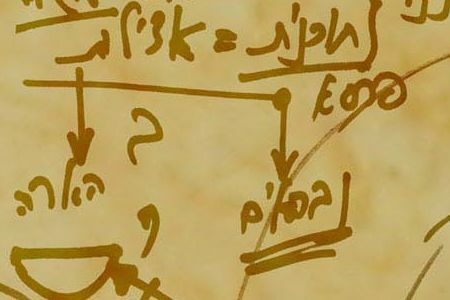 To do that, one who wishes to ascend to the human degree, and discover the Creator and the worlds around us must follow the unique line known as “half a shekel,” meaning neither to the right nor to the left, but the joining of the two. The will to receive, too, takes part because it is “help made against us” (Genesis, 2:18), and against it you need the reforming light. We have two lines: on the left is the will to receive; on the right is the light. The more we combine them, the more we correct the will to receive to similarity with the light—working in order to bestow. It is written, “And the night will shine as the day; darkness as light” (Psalms, 139:12). This is how we advance. This is the first correction—no more and no less, but precisely half. We advance when we achieve that correction, that method of advancement. Subsequently, the tabernacle and its vessels must be prepared, including the oil and all that comes with it. The role was given only to Bezalel. Bezalel within us is that which is Betzel El (in the shadow of God), under the shadow of the Creator. Bezalel replicates the qualities from the Creator, who appears to him, and this is why he is called “wisehearted.” He knows the right combination between the heart, the desire, and the wisdom, namely the intellect. Bezalel properly combines the right with the left, and has wisdom of the heart. This is why he is the one who can establish the tabernacle. The tabernacle is the arrangement of the soul that we build within us from our 613 desires. It is built according to the right qualities, in which all the parts are connected in synchrony with the Creator. This is how we become similar to Him. Our evil inclination has 613 qualities we must aim in order to bestow, toward love of others. Only those who have the quality of Bezalel—copying the qualities of the Creator onto oneself and becoming as His shadow—can do it. Achieving this is done by connecting to the Shechina (Divinity), Malchut of Atzilut, who begins to replicate these qualities from Zeir Anpin of Atzilut. Zeir Anpin has six Sephirot: Hesed, Gevura, Tifferet, Netzah, Hod, and Yesod, where Malchut comes last and replicates. This is why our work is to replicate these six qualities from Zeir Anpin—called HaKadosh Baruch Hu (The Holy One, Blessed Be He), or Zeir Anpin of Atzilut—in the appearance of the Creator on all the workdays. The wisdom of Kabbalah presents our goal—the revelation of the Creator to the creatures in this world. Through our senses, when the Creator is revealed to us, we join and increasingly attach ourselves to the Creator. When we conclude replicating the six qualities comes the concluding seventh quality, the Sabbath. The Sabbath concludes itself by itself from above. This is why it is considered “awakening from above.” A special light comes and sets the six qualities in the right order, and there is nothing more we need to do. This is why the prohibition on working during Sabbath is tantamount to intervening with something that belongs to the upper light. We work for six days setting up the right and left lines, directing the will to receive and the light, the mind and the heart. Finally, we present our work, and then “The Lord will conclude for me” (Psalms, 138:8). This is when we receive the completion of the degree. This is the process we must undergo through the correction of the entire soul, week by week until we conclude the six thousand years. We must also consider that our soul consists of desires from the evil inclination that cannot be spotted by ordinary scrutiny. They require special examination that only the golden calf can make. Although the Torah presents it in this way, the golden calf does not represent a fall or a decline, nor does it blame anyone. Any person who experiences this process must go through all the descents and falls, just as it happened with Pharaoh in Egypt, and with the children of Israel in the desert after the events of Mount Sinai. Even when we move from Mount Sinai to the forty years in the desert we will continue to experience states that seem negative. Each time uncorrected desires surface, we “fall” into them, so we have no choice but to discover them and correct them. 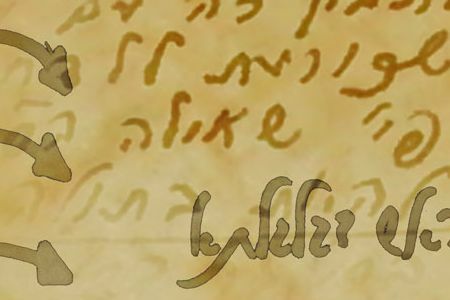 It is written, “There is not a righteous man on earth who does good and will not sin” (Ecclesiastes, 7:20), or “A person does not comprehend words of Torah unless he has failed in them.” Thus, first we must fail, scrutinize the failure and correct it, and then we are guaranteed to not repeat it. We are guaranteed to be kept because that desire has already been corrected into having the aim to bestow through which we progress toward love of others. Our corrupted desires are called “mixed multitude.” They ask, “Where did Moses go?” They claim we must keep going as we understand it, within us, following our reason and intellect, instead of above reason. When we return to working within reason we are delighted. It seems to us that this way we understand and feel everything. We may not be ascending to higher degrees, but at least we are in a world that suits our egos. It is a very appealing state. We can see for ourselves how difficult it is to explain to people what nature is compelling us to do now, what is the method of correction and how we can rise to the next level. The Creator, nature, Elokim (which is nature in Gematria) is pressing us and wishes to raise us, and we are seemingly resisting it with a golden calf, celebrating and rejoicing. When the point in the heart appears, it collides very powerfully with the egoistic desire that has broken out once more. That collision is the shattering of the tablets. The collision is between the point in the heart—through which we desire to rise and cling to the upper one, to a higher degree, to discover worlds, infinity, and be in a realm of bestowal—and the revelation that we are actually at the point of being a golden calf. We cannot tolerate that contrast, and as a result, all the elements in which we were previously in Kedusha (holiness) shatter. Those who sinned in the calf were sentenced to death. Subsequently, Moses called, “Whoever is for the Lord, come to me!” (Exodus, 32:26). This is the correction of the desires that have appeared now, that are connected to the golden calf, and with which it is impossible to continue. Following the correction of all the other desires—the three thousand discernments that Moses killed—he ascends to Mount Sinai yet again. Internally, it means that that point within us rises once again and we receive the tablets of the covenant once more. We rediscover Godliness, the Creator, and begin to come down with the second tablets. Yet, there is a big difference between the first tablets and the second tablets—Yom Kippur (Day of Atonement). The first tablets and the golden calf took place on the ninth of Av (11th month in the Hebrew calendar). The occurrence of the first tablets happens from Shavuot to the ninth of Av. Those of the second tablets take place from the ninth of Av to Yom Kippur. Forty days plus forty days are the time frame of correction from which it is possible to continue. Half a shekel, half a hin, means half a measure. The Vav is the middle between the two Heys because the Vav is the middle line, called “scales,” which weigh the two lights, right and left, being the two Heys, so the left will not be greater than the right. This is why he diminishes the left, so it will not shine from above downward but only from below upward. Our big will to receive, the ego, is on the left side. The light, which we can draw if we work correctly, according to the instructions of the wisdom of Kabbalah, is on the right. These are the two Yods, as in the letter Aleph, with the diagonal in the middle as the Parsa (partition) [ ]. We must join the light from above, the upper Yod, with the will to receive from below, namely the lower Yod (sometimes written as Dalet, which is Behina Dalet, the Malchut in us, instead of the Yod). The diagonal line keeps the balance between them, thus creating the line. This is why Aleph is the first letter in the alphabet. The portion, Ki Tissa (When You Take), is the beginning of the actual Torah because it engages in the building of the tabernacle and its filling. This is why we must constantly maintain that half, so the right is not more than the left or the other way around. If there is a surplus of desires to receive that we did not correct to the fullest possible extent, then we are not in the desire to bestow. If we take from the will to receive more than we can correct, we are in a state of recognition of evil. It has to be a very precise operation. Once we restrict all our desires and avoid using the desire in order to receive, but only in order to bestow, we can continue sorting out those small parts of our desire from light to heavy, and join all the corrections to the light. This is the letter Vav with the punctuation marks, Holam, Shuruk, Hirik, or Kamatz, which is as the Parsa. The light has to be above it because all the corrections are in ascent. In our world—our situation—we will never achieve the revelation of Godliness. There might be various psychological phenomena, but the revelation of Godliness can happen only if we rise above the Parsa. Following the restriction, once we have the middle line, when we join a group and act in it—as Kabbalists suggest we should—when we try to come out of ourselves and be above reason, above the diagonal Vav, from below upward—we receive the revelation of the spiritual world. Beresheet (Genesis) speaks of the creation of the world. In the desert, things take a long time to unfold, with numerous details along the way, as the portions describe. What do those details symbolize? The Torah cannot tell us about all that we are going through. It only explains the milestones. It is similar to driving on a road where each mile or several miles are marked by signs. Why are various garments and a description of the altar mentioned in the desert? It is the correction of our soul. We have received a system of 613 desires, and each of them consists of all the others, and all are connected. That system is completely broken. It is as though we were given an electronic or mechanical device that is completely broken and we have no clue how to fix it. We would look at it dumbfounded without knowing how to approach it. We cannot understand how important our world is, with all its complexities and myriad connections, every atom and every cell in the universe. This is why there are so many details in the correction of the soul. One who walks this path takes part in it and discovers it, and it arouses immense excitement and a sense of harmony and fulfillment. How do you explain that everything exists and happens simultaneously—the point in the heart is on Mount Sinai, the highest connection, while other desires in me are building a golden calf? This is the detachment within, where the Moses in us disappears. When Moses disappears we lose contact with the Creator, as this is the only point that connects us with Him. As soon as we disconnect, we find ourselves immersed in our desires, falling into the golden calf. These are the Kelim (vessels) we have taken out of Egypt, Kelim that want the light of Hochma (wisdom), namely pleasure for ourselves alone. How come the desire obtains contact with the upper force and promptly afterward falls into connection with the golden calf? There are no delays. There is either Kedusha (holiness) or Klipa (shell/peel). There are no in betweens. We must get used to constantly being in one of the two states; there are no others in our world. Are Moses’ ascents and descents on Mount Sinai the ups and downs we are talking about? 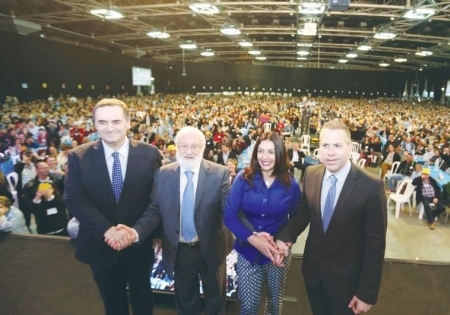 Zohar for All, Pinehas, item 247. Babylonian Talmud, Masechet Gitin, p 43a.